Wherever you find almonds, you can grow pistachios. The crop originally was found in the dry mountain slopes in Iran, Turkey and the middle east. Over time the pistachio tree/bush was cultivated and hybrid. 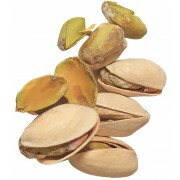 California started growing pistachios in the early 1980's and California now has most of the world pistachio orchards..